Banded gneisses within the Randesund area, southeastern Norway show evidence of the control over their presently observable banding by original supracrustal stratification. Most of these banded gneisses appear to be essentially isochemically metamorphosed supracrustal rocks; some also exhibit the results of chiefly chemical metamorphic differentiation; some bands have undergone marked cataclasis; some bands contain potassium feldspar grains at least some of the constituents of which have moved into their present relative positions since the original supracrustal materials were deposited; and, some bands possibly have undergone at least partial anatexis and gained local mobility during their histories. Nearly all the gneisses show evidence of having undergone structural deformation with formation of features generally considered to represent "flow zone" conditions. 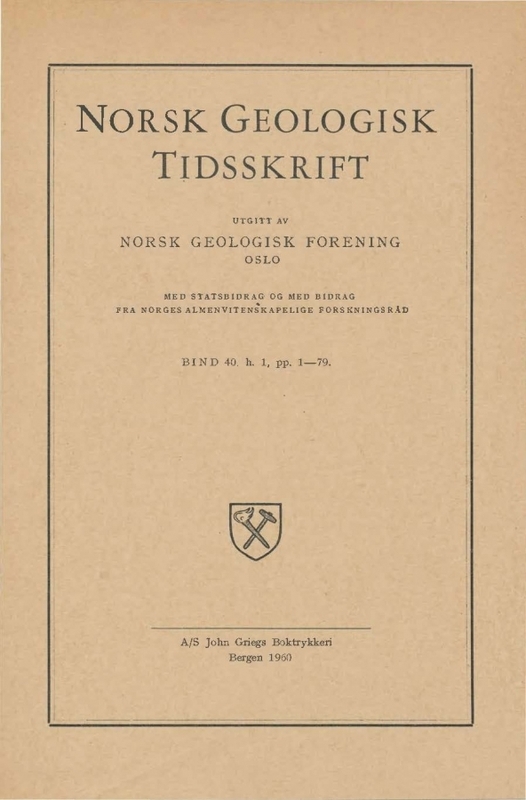 Especially noteworthy parts of this paper so far as general petrologic considerations are the discussion and partial checking of certain aspects of the validity of the BARTH two-feldspar geothermometer and the trace element analyses of amphibole-rich bands of the Randesund area gneisses. It is concluded that although certain aspects of the thermometer's validity need further checking that it is of great use so far as determining at least local relative temperatures at which equilibrium last existed between the feldspar phases. Also, trace element studies such as those made appear to offer a means of possibly determining origins of diverse amphibole-rich rocks within some given metamorphic facies of certain areas.